The North Carolina Tigers hosted the Baltimore-Washington Eagles on Saturday in their final regular season game of the year. It was a hotly contested affair with the Tigers hoping to avenge a road loss to the Eagles earlier in the season and both sides hoping to carry some momentum into next week’s nationals. The Tigers had a great start jumping out to early lead booting 5 goals to 2 in the first quarter. The Eagles upped their work rate in the 2nd and 3rd quarters however, and were able to wrestle both the momentum and the lead away from the Tigers to hold an 8-point advantage going into then final term. The afternoon belonged to the Tigers though, with a 6-goal final term securing the comeback win and sending the North Carolina side into nationals with a big confidence boost. The Tigers midfield got the side off to a flying start with Nick Camilleri and Pete Capozziello slotting home the side’s first 2 goals of the game. As the quarter wore on, the Tiger’s continued to grab the ascendancy all over the ground with their work ethic and tenacity for the ball around the packs. Tiger’s first gamer Jason Falla and rookie Mike Hoffman won plenty of the ball early and provided the Tigers’ strong forward line with plenty of opportunities. It wasn’t long before the Tigers were able to capitalize with Scott Elms, Scott Bradley and Paul Duncan all registering majors before the first break. Having realized the improvement in their opponents since the beginning of the season, the Eagles responded well in the 2nd quarter as the away side lifted all over the ground. BWE’s midfield led the way, grabbing the momentum with consecutive center clearances and organization around the packs. The Eagles were able to take the Tiger’s height advantage out of play, clogging up the game and taking advantage of a running ground game to take the sting out of North Carolina’s attack. In a low scoring quarter, BWE was able to kick the only two goals of the term to find themselves within 5 points at half time. The Tigers’ defense limited the damage, with Andrew “Taco” Wesche, Dennis Kurtz and a number of rotating Tigers making desperate plays to prevent goals. The Tigers started the second half well, getting the ball out of the middle and registering the first 3 scoring shots of the quarter with Paul Duncan converting to extend the lead. The Eagles weren’t going away so easily though, with a hard-running midfield sparking a string of 4 straight goals for the visitors. The hardworking Tigers’ side struggled to find answers to the slick ball movement of the Eagles, but Sammy Elms was able to stem the tide with a late goal to get Carolina within 8-points at the last change. The beginning of the last term was marred by an unfortunate injury to Eagles’ star Jake Moyer. When play was restarted, coach Wes Mac’s strategic move to get Dara O’hannaidh on ball paid immediate dividends. The Irishman was able to nullify BWE’s best ball winner and win plenty of the football himself as the Tigers began winning center clearances with ease. Alton Wright’s return the Tigers’ side continued to be welcomed giving hardworking ruckman Tom Shifflet a deserved spell and helping get the ball into the hands of the Tigers’ rovers. Tim Cashman made his presence felt with a number good marks leading to inside 50’s for the Tigers where he was often able to find Elms and Duncan, who combined for 4 of the Tigers’ 6 goals in the last quarter. 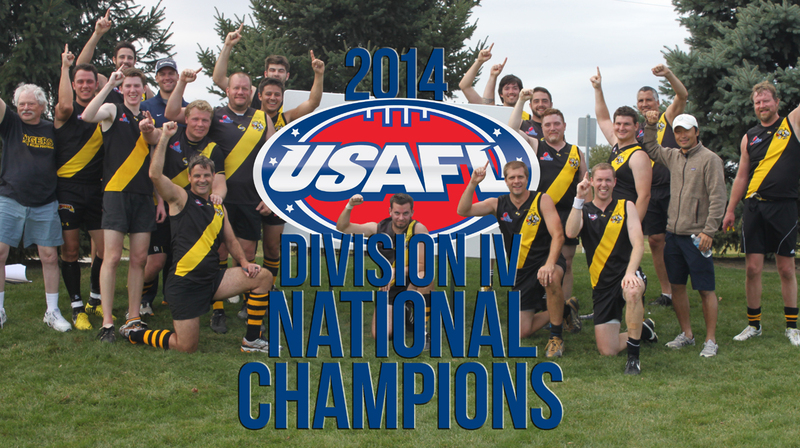 The final siren put an end to Tigers onslaught, completing a big come from behind victory heading into Nationals. Goals: Duncan 4, Elms 4, Camilleri 2, Capozziello, Sc Bradley, Cashman. The North Carolina Australian Football Club would like to wish Jake Moyer of the Baltimore Washington Eagles a speedy recovery from his injury suffered during the game. We wish Jake all the best and look forward to seeing him back on the footy field next year.